A BLOG ABOUT ALL THINGS FRENCH IN SYDNEY AND BEYOND. I know that I have said many times before that I want to live and die in Paris and that is without a doubt the truth and my sincerest feeling. 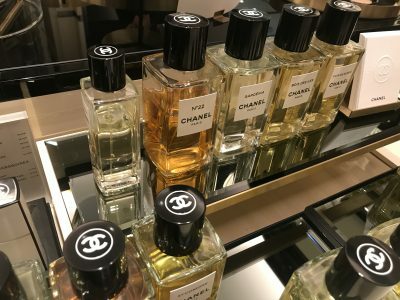 However, after paying a visit to the Hotel Ritz and taking a peek into the glorious Chanel Spa I think I will now adjust my thinking to wanting to live in Paris and to die an overly pampered and spoiled woman at the Hotel Ritz but in particular to peacefully leave this life at the Chanel Spa after experiencing the epitome of luxury. 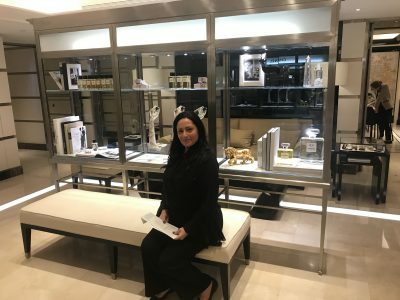 If you have read my blog piece about my unforgettable afternoon visit to the Hotel Ritz where I had an incredible birthday high tea with mon mari at the acclaimed Salon Proust and then a sneaky peeky around the hotel you will have already gathered that I have become completely enamoured with the Hotel Ritz. The history behind the Ritz Hotel, its lush interiors, impeccable service and attention to detail makes it one of the most luxurious and outstanding hotels of the world. However, after the Hotel’s major renovation and reopening in 2016, the hotel has become even more grand and worthy of royalty. 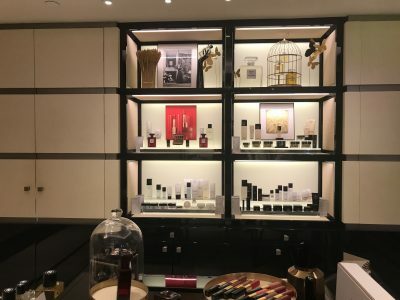 What truly impressed me was the new addition to the hotel – the Chanel Spa, the first and only kind in the world and so opulent and luxurious that even Coco Chanel herself would never want to leave it. 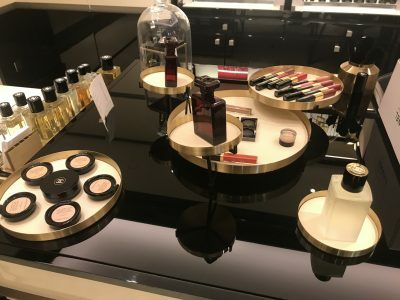 As I took my sweet and pleasurable time to explore the Hotel Ritz I couldn’t leave without at least seeing the famous Chanel suite where the grand dame of fashion lived for most of her life and of course the new Chanel Spa. 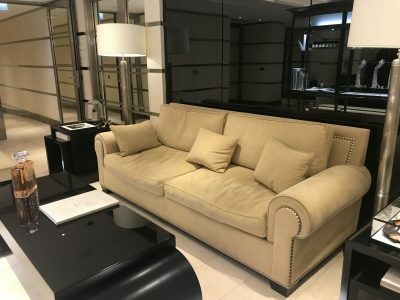 I shyly approached concierge and timidly asked if it would be possible to take a look at the Chanel suite and was treated with such patience and acordiality even though I was not a guest at the hotel. 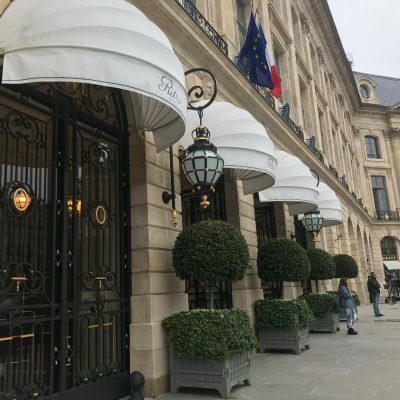 Unfortunately for me, the Chanel suite was occupied and so I missed an opportunity to indulge a life long whim, however, concierge reassured me that if the room was unoccupied on my next visit to the Hotel Ritz I would be granted a peek inside. To ease my disappointment le concierge offered for me instead to be escorted down to the Chanel Spa where I could take a glimpse at this stunning new addition to the hotel. 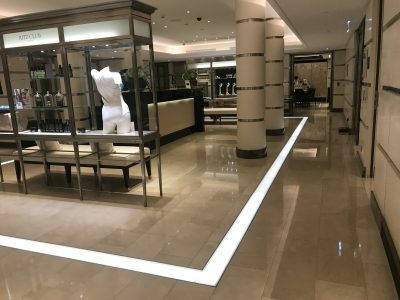 As I walked out of the lift, escorted down by a lovely staff member, and entered the Chanel Spa reception zone it was as though I had entered another world and was immediately mesmerised by the sheer beauty and luxury of the spa. The scent of amber, the signature fragrance of the spa and hotel, together with the soothing neutral tones of beige, gold and cloud white of the interior calmed my senses and beckoned me to relax and unwind. The reception room of the Chanel Spa is more like an elaborate hotel lobby compartmentalised into delightful vignettes of everything Chanel. 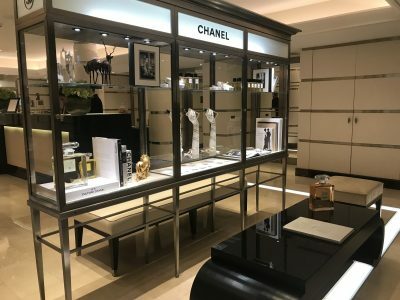 A lovely vitrine, displaying all things inspired by Chanel, anchored the space to reveal a cosy yet plush waiting area with a signature beige classic Chanel sofa reminiscent of her famous beige couch at 31 Rue Cambon designed by Coco herself. 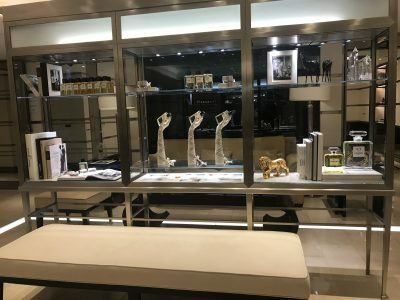 Behind the lounge area and flanked by a display shelf was the cosmetic room/boutique to the very back of the space where you can purchase Chanel cosmetics, skin care and fragrance as well as receive a make over or cosmetic consult for quite a hefty sum. In fact, the design of the Chanel Spa found its inspiration in Coco Chanel’s Ritz suite designed and furbished to the demands, vision and desire of Coco Chanel and indeed everything that you see here is like an extension of not only Chanel’s hotel suite but of her historic and stroryed flagship boutique at 31 Rue Cambon only minutes away from the Hotel Ritz. The story behind the design inspiration and my little tour of the spa was kindly offered by one of the lovely beauty consultants who escorted me throughout the space and allowed me to have a quick glimpse into the incredibly breathtaking art deco inspired pool room which was for me a highlight of my brief time inside the Chanel Spa. For privacy reasons, I was unable to take photographs, however, the picture of grandness presented to me is an image I will never forget and hope to one day experience for myself. As the grand doors into the pool room opened they revealed a heavenly over sized mosaiced, turquoise blue swimming pool and two opulent winding staircases that seemed to cascade into the water like elaborate water slides. The staircases with their lacey black wrought iron design, a nod to the famous staircase in 31 Rue Cambon, together with the countless beige columns enhanced the grandeur of the pool room. The cloudy pale blue sky ceiling mural, the plush tones of beige and dreamy white upholstered pool side lounges seemed to encourage total mind and body transcendence. As if sensing my near faint constitution, brought on by the sheer beauty of the Chanel Spa design, my intuitive beauty consultant tour guide ushered me to take a seat on the beige sofa and offered to bring me a chilled glass of water or perhaps a taste of the spa’s signature apple cucumber wellness cocktail – a gesture that seemed not out of the ordinary here at the Ritz where service and attention is above and beyond exceptional. The beauty consultant returned with my chilled glass of water and sample taste of the wellness cocktail that gave me a very necessary late afternoon perk and handed me a pretty envelope containing the loveliest brochure I had ever seen listing all the beauty services offered at the Chanel Spa. Like the brochure itself, the design of the opulent massage rooms, my last stop on the spa tour, were inspired by Chanel’s beloved Asian coromandel screens which continued the theme of beige, gold and black tones adding that unmistakable Chanel touch of luxury and richness to the room. Thank you to Fifi Flowers art on this site is created by a true artist.